Kultuurikatel is an ongoing reconstruction project of an old Tallinn Power Plant complex, located close to Old Town & Passenger Harbour and part of a several mile long industrial belt along the coast line. The existing complex is under heritage protection and dates back to 1860s when Tallinn’s Gasworks was built there. Power production was shut down in 1979, and until the 1990th the plant was producing district heating. Andrei Tarkovski shoot parts of „Stalker“, his most famous film, here in 1979 and influenced with the morbid charm of the ‚Zone‘ our space esthetics till today. Designed by the architects Malle Meelak und Mart Port and built between 1973 and 1984, Väike-Õismäe was planned in the tradition of the ‚ideal city‘. 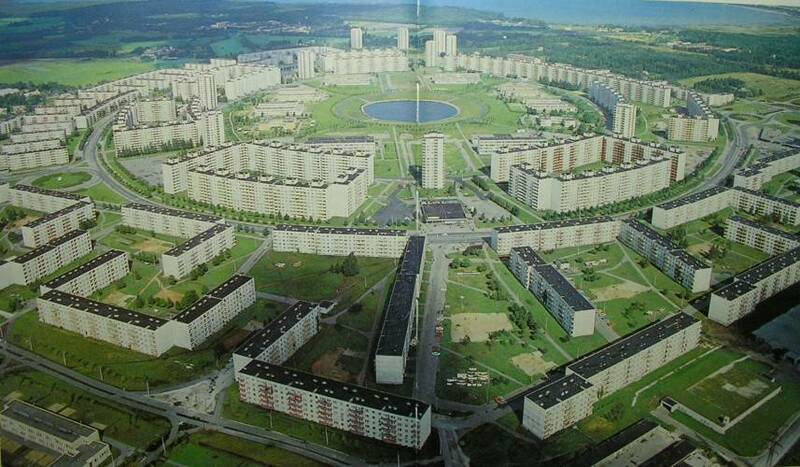 With concentric rings of five- to nine-story buildings totalling one kilometer in diamter, the protected inner ring is green and incorporates an artificial lake, kindergardens, school-buildings and social facilities. The traffic infrastructure is almost completly banned to the outer rings. A steady walk from the outer ring through the building corridors into the inner ring will reveal a gradual decrease in urban noise levels. On a quiet day, it is said, one can hear the reflection of his or her voice off a building on the other side of the lake in the center of the complex. The 1994 competition for the new building of the Art Museum of Estonia was the greatest event of the early 1990’s Estonian architectural scene. Participants from ten countries contributed 233 designs, but all the prizes were awarded to Finnish architects. The winning entry „Circulos“ was designed by Pekka Vapaavuori – a young architect from Tampere. „Circulos“ centers around a great arch that determines all the major circuits of movement inside the building. Kumu was cut into the limestone ground of a hill and is almost invisible. The building was completed in 2005.